In another sign of the ascendancy of solar photovoltaic (PV) technology to the ranks of world-class energy production, Bloomberg New Energy Finance (BNEF) predicts that globally new solar panel capacity will surpass new wind capacity for the first time ever in 2013. BNEF anticipates that the tally of new solar for the year will be 36.7 gigawatts (GW), just above the 35.5GW of new wind power that they expect. Given the short-term nature of BNEF’s prediction (most of 2013 has already passed us by), it is not likely to be far from the truth once all the figures are added up next year. This news is particularly significant because wind power has conventionally been seen as a more viable option in terms of cost-effective clean energy generation than solar power ever has, doubtless due in part to its similarity to the energy generation status quo: i.e. larger-scale, centralized power plants. The comparatively large amount of wind capacity already deployed is also sometimes cited as evidence of wind’s superiority to solar. 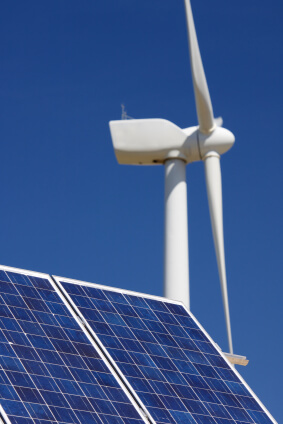 At the end of 2012, there was about 3 times as much cumulative wind power capacity installed as there was solar PV. The image that many people have of solar power, meanwhile, is of a solar system small enough to be mounted to the roof of a single house. 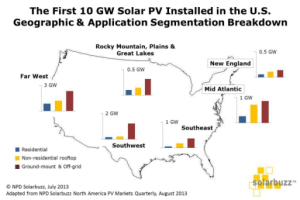 While it is true that solar panels have achieved viability in the residential sphere, and residential solar system numbers are growing rapidly, in the US there is in fact much more solar capacity in ground-mounted & off-grid solar installations than on roofs (as per the image from Solarbuzz). Solar, therefore, has potential to grow in both sectors, whereas wind power technology has not yet proven its investment-worthiness for on-site, small-scale projects for individual homes and small businesses. The reasons cited by BNEF for the apparent change of fortunes for solar power have to do with a decline in new wind capacity almost as much as they do with the growing success and deployment of solar PV. Changes in government support mechanisms or regulatory uncertainty in 2 key markets–the US and China, which combined account for 60% of the world’s wind market–will be the key factors in an expected 25% drop in new wind capacity compared to 2012. But the shift also has to do with the changing economics of solar power. The falling cost of solar PV technology and incentive support from a growing number of governments (BNEF points out China and Japan) has resulted in an increasingly favorable global environment for solar deployment. Short-term forecasts by other analysts–Deutsche Bank, for example–also see rooftop solar installation number skyrocketing in the next few years, with another 40GW of capacity coming online by 2018 in the US alone. Slightly longer-term forecasts other organizations such as McKinsley predict that solar power will reach unsubsidized price paritywith coal and nuclear plants as early as 2020. BNEF projects that solar power will be on a more or less equal footing with wind power from here on out, each adding new capacity annually at about the same rate. By 2030, they say, wind power will comprise 17% of global electricity production capacity (up from 5% now) and solar PV 16% (up from its current share of 2%). At 30% of the entire world’s electrical generation capacity, this would of course good news for the environment and climate change. But it still a long way from a 100% renewable electricity system, especially in light of the low conversion efficiencies of these two technologies. Nevertheless, it is encouraging that renewables are likely to make so much headway in such a relatively short amount of time, and offers hope that future estimates from the likes of BNEF will be revised upwards as time goes on and new data rolls in.